How to load not only categories but also pages (as in Wikipedia articles) and enrich the graph by querying DBpedia. In doing this I’ll describe some advanced usage of APOC procedures. Everything I explain here will also go into an interactive guide that you can easily run from your Neo4j instance. Or why not giving it a try in the Neo4j Sandbox? For a description of the Wikipedia data and the MediaWiki API, check QuickGraph#2. This approach uses the WikiMedia API and is adequate if all you want is a portion of the category hierarchy around a particular topic. Let’s say we want to create the Wikipedia Knowledge Graph about Databases. The first thing we’ll do is create the root category: Databases. Now we’ll iteratively load the next level of subcategories to a depth of our choice. I’ve selected only three levels down from the root. Notice that we are only loading the id and the title for each page. This is because the MediaWiki API only exposes metadata about pages, but we can get some extra information on them from the DBpedia. DBpedia is a crowd-sourced community effort to extract structured information from Wikipedia and make this information available on the Web. There is a public instance of the DBpedia that exposes an SPARQL endpoint that we can query to get a short description of a given Wikipedia page. The Cypher fragment below embeds the SPARQL query that’s sent to the endpoint. I’ve limited to 100 pages per level because we are generating an HTTP request to the DBpedia endpoint for each Page node in our graph. Feel free to remove this limit but keep in mind that this can take a while. 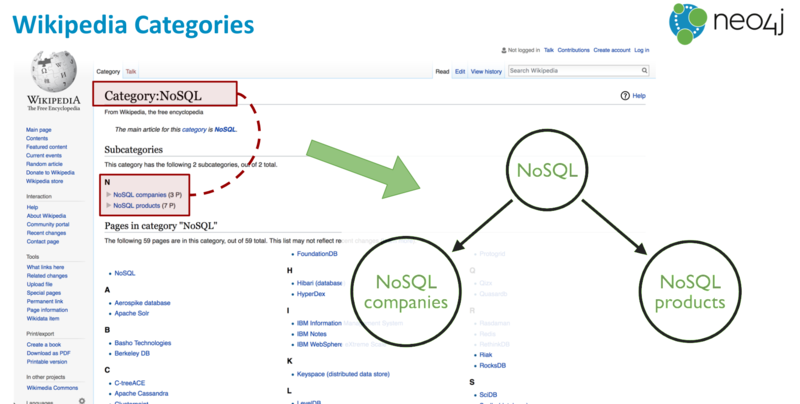 Ok, so we have our Wikipedia Knowledge Graph on Databases and we can start querying it. We can list categories by the number of sub/super categories or by the number of pages. We can also create custom indexes like the balanceIndex below that tells us how ‘balanced’ (ratio between supercategories and subcategories) a category is. Closer to zero are the more balanced categories and closer to one are the more unbalanced. There is a snapshot of the Wikipedia categories and their hierarchical relationships (as of mid-April 2017) here. It contains 1.4 million categories and 4 million hierarchical relationships. They can both be loaded into Neo4j using LOAD CSV. You can run the queries as they are or download the files to your Neo4j’s instance import directory and use LOAD CSV FROM "file:///..." instead. First the categories. Notice that we are loading a couple of extra properties in the Category nodes: the pageCount and the subcatCount. These numbers are a precomputed in the data dump and not always accurate. Start by downloading the latest DB dumps from the Wikipedia downloads page. For the category hierarchy, you’ll only need the following tables: category, categorylinks and page. Load them in your DBMS. It showcases interesting usages of procedures like apoc.cypher.doit to run Cypher fragments within our query or apoc.load.json to interact with APIs producing JSON results. Rich category hierarchies like the one in Wikipedia are graphs and extremely useful for recommendation or graph-enhanced search. Have a look at the queries in QG#2 and the ones in the interactive guide for some ideas. 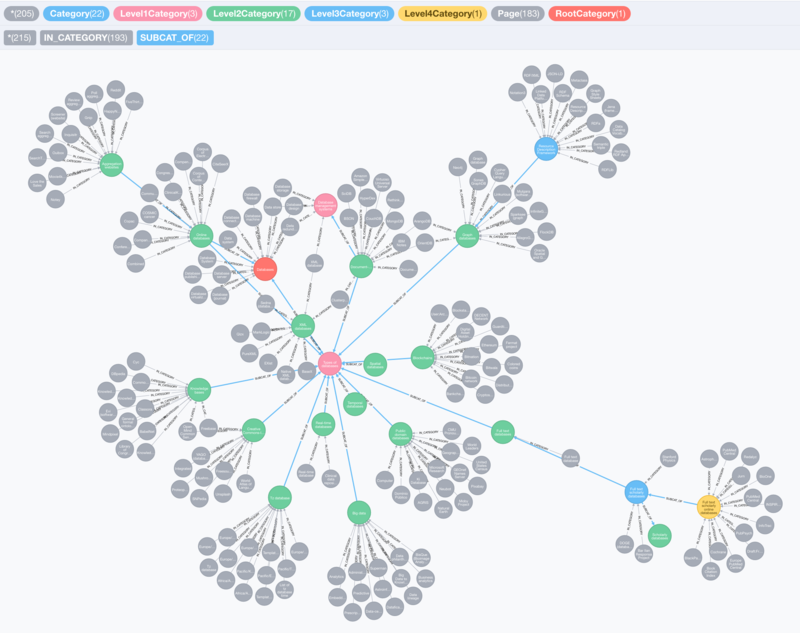 Posted in QuickGraph.Tagged KnowledgeGraph, Neo4j, QuickGraph. Neo.ClientError.Procedure.ProcedureNotFound: There is no procedure with the name `apoc.cypher.doit` registered for this database instance. Please ensure you’ve spelled the procedure name correctly and that the procedure is properly deployed. Change the procedure from ‘apoc.cypher.doit’ to ‘apoc.cypher.doIt’ .